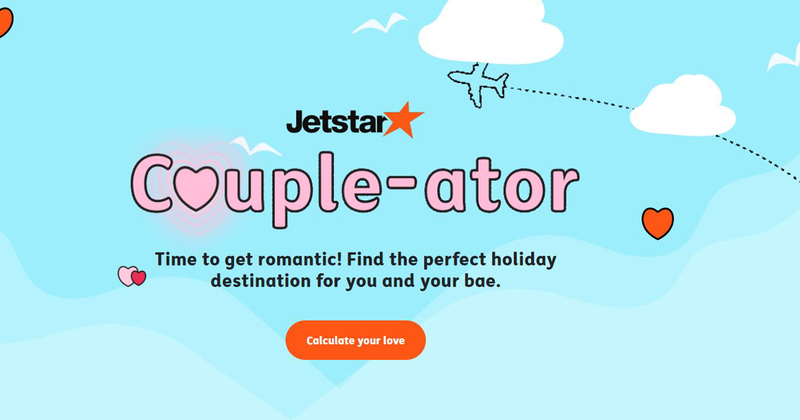 As Valentine’s Day approaches, Jetstar has created the Couple-ator, a fun tool designed to recommend couples the perfect destination for their next getaway and help alleviate travel woes ahead of the romantic day. A recent survey by Jetstar suggests that couples are having a rough time deciding where to spend the holiday together with 83% of travellers disagreeing with their partners while travelling, and 34% of these arguments happening before they even embark on the trip. 53% of respondents also find it difficult to choose a destination where they can both do what they love. Other challenges identified include finding a destination that fits both their budgets (25%) and one that has food they would both enjoy (17%). The Couple-ator’s main objective is to help answer questions about what the first date was like and how you like to spend the weekend as a couple and have the service decide your next bae-cation destination! Jetstar spoke with three different couples and found out that it doesn’t matter if you’ve been a couple for one year, or 40 years – you’ll still have disagreements when it comes to what to do or where to go on vacation. What do these couples disagree about? Watch this video to find out. From now until 28 February, couples can take the quiz and stand a chance to win free a pair of return flights and two nights’ accommodation to your Couple-ator destination. To join, simply share your destination on Facebook, tag @JetstarAsia and #JetstarLove2Fly, and share why you two deserve the ultimate bae-cation. Terms and conditions can be found here.